Castle Grows Again in Ontario. Castle continues to grow its footprint across Canada with the announcement of its latest member in Ontario. Located in Nestor Falls, Falls Hardware has opened their doors as the newest Castle Building Centres location in Ontario. The location will continue to serve the building material needs of the local community and surrounding northwestern Ontario region as they have done for over 60 years. Falls Hardware is a full-service retail store and lumberyard and with their move to Castle, they are excited about adding new products to the assortment of hardware, key building materials, and community specific products. “Bill and Nancy are a great example of successful independents who moved to Castle because they want to keep their business moving in the right direction. Independents continue to discover the possibilities with our winning business model and Castle’s commitment to helping our members grow their brand” Ken Jenkins, President Castle is pleased to welcome Falls Hardware to the family! Castle continues to expand in the Western Region of Canada with the announcement of their latest member location, Thermo Pro Insulation and Drywall. Located in Lacombe, Alberta, the new Castle store was established 10 years ago as a building material supply and installation company, specializing in insulation and drywall for new construction and renovation. “Being part of the Castle group has helped our family business move forward and experience tremendous growth. I am confident that transitioning Thermo Pro to Castle will have significant benefits and provide additional growth opportunities for this segment of our business.” John DeRegt, Co-owner Thermo Pro & Wolf Creek Building Supplies. Thermo Pro provides surrounding area contractors in commercial, agricultural and residential construction with drywall, spray foam and spider insulation. They also supply and install steel stud and suspended ceiling products. The company also operates a full fleet of delivery and installation vehicles servicing all Central Alberta. Castle is pleased to welcome Thermo Pro Insulation and Drywall to the family. Castle maintains its steady growth across Canada, this time in the Prairies with the announcement of Imperia Wholesale and Retail Inc. This new member in Morden, Manitoba, is in the Pembina Valley region. With their entrepreneurial spirit and work ethic, owners Volodymyr Shkyne and Viktor Shulz are focused on growing the community for the better and building a legacy for generations to come. The new Castle location and lumberyard will be offering an extensive selection of key building material products and hardware. Volodymyr and Viktor are involved in many community projects around the city and continue to forge successful relationships and work with local businesses and trades. Being able to support the increasing building needs of the city is one of these aspects. After looking at other industry banners, they were impressed by Castle’s range of retail business solutions. Castle is pleased to welcome Imperia Wholesale and Retail Inc. to the family. Castle’s expansion across the country continues with the announcement of their newest member location in the Maritimes. Cabot Building Supply in Dingwall, Nova Scotia, will service the building materials needs of the surrounding communities. The family-run business was founded in 1979 by Murdock MacLeod before son Kirk and daughter Kimber joined a few years later. After four decades of community connection, and earning a trusted reputation in the marketplace, the family felt it was time to join a buying group. The new Castle store and lumberyard will offer an extensive selection of key building material products including siding, insulation, gypsum and roofing, as well as home improvement and hardware. They will continue to serve the community and surrounding area while offering a more expansive product assortment and competitive pricing. The team plans to expand the footprint of the store in late Spring 2019. Castle is pleased to welcome Cabot Building Supply to the family. Castle announced today that a new member has joined the group in Ontario. The addition of Eastway Construction and Supplies Ltd. in Scarborough, Ontario will service the building material needs of Greater Toronto and the surrounding area. The retail store will offer a full line of building material products and hardware. Owner Raymond Wan brings over 30 years of industry experience and knowledge to the location and is familiar with the benefits of Castle’s approach. He previously owned and operated a former Castle location for many years before deciding to sell his business. Castle is pleased to welcome Eastway Construction and Supplies Ltd. to the family! Castle’s presence continues to expand across all provinces with the announcement of its newest member location in The Prairies. The addition of Bucksaw Timber in Carman, Manitoba, will service the building material needs of the agricultural town and the surrounding community. In addition to a full line of lumber, building materials and hardware, the converted store will also offer a variety of household and pet products. Owners Anthony and Glynis Lemky bring over 18 years of industry experience to the group. After starting their business in 2000, they experienced many years of continuous growth, which included a move to the Haywood area for several years before coming to Carman in 2010. Since then, they have been cultivating their brand and now service countless local contractors and provide products and services for several large community project. Anthony and Glynis are looking forward to a busy summer season with their team of experienced personnel. They are excited to take their business to the next level with greater buying power and offering their customers an expanded product assortment in many categories. Castle is pleased to welcome Bucksaw Timber to the family. Castle continues to expand its presence in Ontario with the announcement of their latest member location, North Dundas Building Supplies. The new Castle store is located midway between Ottawa and Morrisburg, and will service the lumber and building material needs of the surrounding communities, including Chesterville and Winchester. As a new Castle Building Centres location, North Dundas Building Supplies will offer a full line of lumber and building material products. New owners David Nyentap and Stacy Duguay from Russell, Ontario, recently purchased this former lumberyard location and are looking forward to returning it to its original retail roots and adding a new storefront design. Stacey will oversee management of the retail location and the store is planning on an official Castle Grand Opening in early Summer. Castle is pleased to welcome North Dundas Building Supplies to the family. Castle continues to grow in Western Canada with the announcement of Bamfield Builders Supply Ltd., as their newest member in British Columbia. Located on the west coast of Vancouver Island, owners Bob Baden and Kelly Bartlett have been serving the local area for over 20 years. Bamfield Builders Supply was founded in 1997 and the business is built on servicing the unique needs of the Bamfield community and neighboring First Nations village of Anacla. The new Castle location offers an extensive selection of building material products and hardware, while also catering to the local community and climate by providing a selection of sporting goods and outdoor gear. As independent business owners, Bob and Kelly looked at other industry banners but felt joining Castle was the best choice for their business and brand. The store will undergo a rebranding to Castle Building Centres and they are planning a Grand Re-Opening to the community in late Spring. Castle welcomes Bamfield Builder’s Supply to the group. Castle continues to grow with the announcement of New North Exteriors as their latest member in Northeastern Ontario. Located in the heart of North Bay, the location will service the building material needs of the community and surrounding area. The new Castle Building Centres location will offer a full line of building material products, while specializing in the supply and install of exterior products. Owners David Bruneau and Sophie Belanger have over 30 years of experience and purchased the business location just over a year ago. They realized that to grow their business to the next level, they needed to consider joining a buying group. Castle is pleased to welcome New North Exteriors to the family. 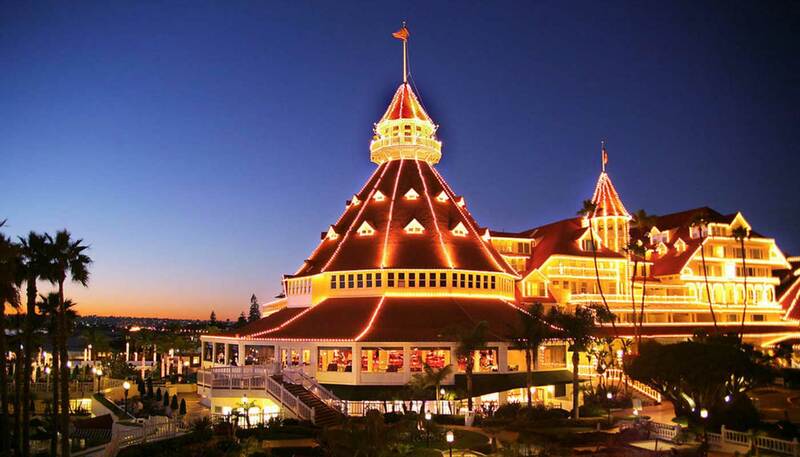 Castle Building Centres Group returned to the historic Hotel del Coronado in San Diego, California to celebrate their 55th Annual General Meeting. The iconic Hotel del has seen the likes of 12 American Presidents, countless Hollywood stars and the rich and famous from all over the globe. The highly anticipated event drew close to 450 Castle shareholders, vendor partners and their families to the west coast, making it the largest buying group conference of the year, once again. Throughout the week, Castle guests experienced an action-packed week of exclusive events on and off-site, plenty of time to relax and enjoy the beautiful Hotel del Coronado beachfront and the opportunity to participate in educational presentations, delivered by some of Canada’s brightest minds. The 2018 Castle AGM kicked off Wednesday evening with the Welcome to San Diego Opening Night Party on the exclusive beachfront Windsor lawn, with the sun setting over the Pacific and a variety of food stations, wine tastings and activities for the whole family. The events continued Thursday commencing with a morning of Castle360 business sessions and presentations from James Jones, Vice President of National Marketing, and Castle President Ken Jenkins. Guests joined Castle that evening at San Diego’s SeaWorld for an exclusive park experience that included private dining, exhilarating rides a special Orca Encounter. On Friday Fun Day, Castle guests had a selection of amazing activities to choose from including an unforgettable day of golf at the exclusive Del Mar Country Club, a Coastal Tour, San Diego Zoo excursion or a private San Diego Foodie Tour. Saturday morning, Castle welcomed Peter Mansbridge, Canada’s most respected and recognized journalist and public figure. Peter delivered a proudly Canadian and powerful keynote highlighting some of his most memorable journey’s around the world followed by a souvenir photo opportunity. The 55th Castle AGM came to a close with a Garden Cocktail Party, followed by a Gala Evening with gourmet dinner and awards presentation. Castle brought the 2018 AGM to exciting finale with the high energy 14-piece ensemble, the Lucky Devils. Guests, young and old, took to the dance floor to dance the night away and say goodbye to friends old and new for another year. Castle continues to deliver a first class, industry leading Annual General Meeting event, with the largest attendance of shareholders and vendor partners giving it stellar reviews. Castle announced today that Van Dolder’s Home Team has joined the Castle group with two locations in Ontario. Situated along the shores of Georgian Bay, the locations will service the building materials needs of their customers in the Owen Sound and Collingwood markets and surrounding areas. The two new Castle locations are focused on offering an extensive selection of key building material products while also offering professional installation services. Additionally, each site boasts a massive designer showroom with built-in model home segments giving their customers the opportunity to picture products inside a home setting. The family business was founded in 1964 by father Andy Van Dolder; sons Kris and Tim continue to cultivate the business under the same principles it was built on; customer service, quality products and professional installation services. This foundation is at the core of everything they do and is a large part of their success, and why they chose to join Castle. Castle President, Ken Jenkins, couldn’t agree more. “Castle is 100% committed to our members’ brand. The Van Dolder’s are an example of how reputation and exceptional service are ultimately what determines success in our industry. Becoming a Castle member means they can continue to focus on growing their brand”. Castle is pleased to welcome Van Dolder’s Home Team - Custom Exteriors to the family. Castle Growth in Western Canada Continues! Castle Business Centres Group announced today, yet another new member location in Western Canada, this time in the province of Manitoba. Reimer Concrete and Lumber is the newest Castle Building Centres location in the province, located in Rosseau River, Manitoba. The new business was founded by Matthew and Perla Reimer, who have over 16 years of experience in the construction industry. Matthew’s extensive construction background, coupled with their expertise in the building materials industry has helped the new Castle member flourish. The new retail location will offer a wide selection lumber, building materials and concrete, as well as an extensive assortment of hardware products. Their decision to join Castle was an easy one after seeing the success one of their family members had within the group. Reimer Concrete and Lumber has built solid relationships over the years in both the LBM industry and the Rosseau Lake Community. They are looking forward to serving Southeastern Manitoba and beyond. The store will have an official grand opening in Summer 2018. Castle welcomes Reimer Concrete and Lumber to the family. Castle announced today that a new member has joined the group in the province of Saskatchewan. LKQ Building Supply is located in the heart of Saskatoon and owner Ken Spetz has been in the construction industry for over 30 years, specializing in finishing and restoration products and services. The new retail location will operate as a specialty supply store to the greater Saskatoon area, providing building materials for restoration and finishing as well as unique product solutions to local contractors. The LKQ staff is excited about the new location, and they are planning an official Grand Opening as Castle Building Centres this coming Spring. Castle would like to welcome LKQ Building Supply. Castle announced today that a new member has joined the group in the province of Quebec. Murexpair Inc. is located in the city of Sherbrooke, Quebec and has been serving the local community for 17 years. Owner, Jonathan Sirois, had a clear plan for Murexpair; to offer exceptional products, sales and service in the categories of roofing and siding to contractors and local consumers. When he and his current partner Bruno Langlois began to consider a buying group, they were looking for an opportunity to grow their business by having access to additional products in their categories, but didn’t want to lose their independence or compromise the core of their business. As part of the Castle group, the specialty store will offer a wider range of steel roofing, siding, decking products and commercial designer steel siding to their valued customer base, consisting of local residential and commercial contractors and consumers. Castle would like to welcome Murexpair Inc. to the family. Fresh off the heels of another industry leading year, Castle Building Centres Group is heading into 2018 with a new member location in Western Canada. Castle announced today that Timber Spirit Supply in Spiritwood, Saskatchewan is the newest independent dealer to join Canada’s fastest growing buying group. The town of Spiritwood is located in central Saskatchewan, about 125 km west of Prince Albert. Entrepreneur, Matt St. Onge founded the business just a few years ago with the goal of building trust with the local community as his guiding principle. Matt and his team of industry professionals continue to follow this creed and strive to deliver customized solutions to local contractors and consumers in the area. Timber Spirit Supply is a full-service lumber, building material and hardware destination and the local community of contractors, home builders and consumers, have come to rely on the great solutions-based service. The team is looking forward to an improved product assortment and a much more comprehensive buying program. A grand opening celebration as Castle Building Centres is planned for the Spring, once the store has gone through a complete rebranding.